Projected insurance rates in Michigan for 2019 are $2,444 a year for full coverage insurance. Comprehensive insurance, collision insurance, and liability cost approximately $544, $992, and $632, respectively. 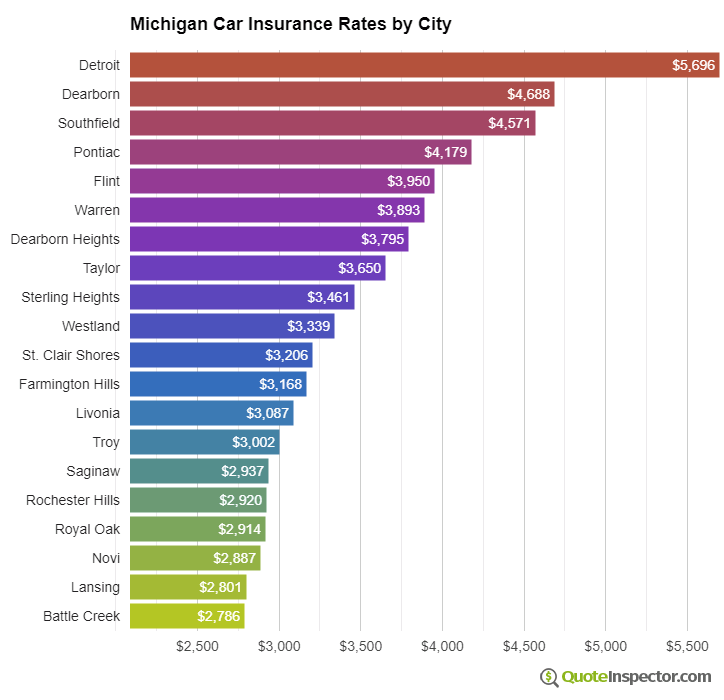 Detroit, Dearborn, and Southfield have the most expensive auto insurance rates, and the three most popular companies in Michigan are State Farm, AAA, and Progressive. For a middle-aged driver, Michigan insurance rates range from as low as $748 for a discount liability-only rate to a much higher rate of $5,272 for a high risk driver. These price differences illustrate why anyone shopping for car insurance should get quotes using their specific location and risk profile, instead of using average rates. Enter your Michigan zip code below to view companies that have cheap auto insurance rates. The chart estimates Michigan car insurance prices for various risk profiles and scenarios. The best price after discounts is $1,405. Michigan drivers who use higher $1,000 deductibles will pay around $2,094. The average price for a middle-aged driver with a clean driving record using $500 deductibles is $2,444. 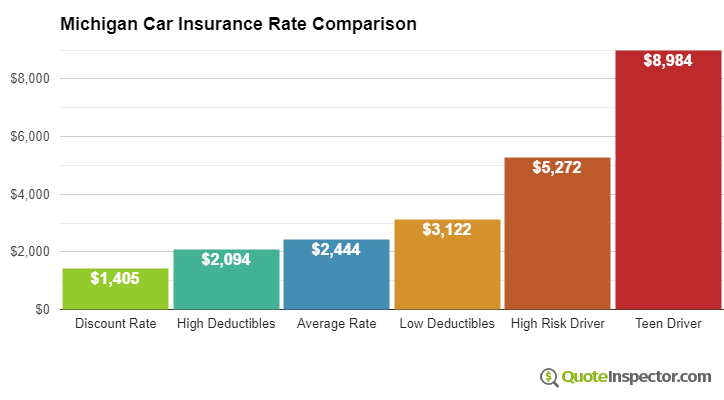 Using more expensive $100 deductibles for physical damage coverage could cause an increase to $3,122. Drivers with multiple violations and accidents could be charged around $5,272. The price for full coverage for a teenager can get as high as $8,984. Car insurance rates in Michigan also range considerably based on your risk profile, your choice of vehicle, and physical damage deductibles and liability limits. The city you live in plays a big part in determining prices for auto insurance prices. Areas with less traffic congestion could have rates as low as $1,900 a year, whereas some neighorhoods in Detroit and Dearborn may see rates upwards of $5,700. Geographically different areas within the same city can have significantly different rates. These geographic rate differences highlight the importance of getting rates based on your location. The company you buy your policy from obviously affects the cost of coverage. In Michigan, every insurance company has their own rate formula, and prices can be substantially lower or higher based upon different risk factors. In Michigan, auto insurance prices range from $1,058 with Safeco to as high as $4,730 with Encompass. Other companies like USAA, GEICO, and MetLife generally fall somewhere towards the middle. Those most likely are not the rates you would pay, as your motor vehicle report, the type of vehicle you drive, and where you live in Michigan have to be considered. The type of vehicle you drive is a large factor when calculating the price of auto insurance coverage in Michigan. Electing to drive a more affordable and lower-performance vehicle will cost less to insure thanks to cheaper replacement cost and reduced frequency of accidents. The table below shows premium estimates for the best selling vehicles in Michigan. Because rates have so much variability, the only way to figure out which company is cheapest is to compare rates and see which company has the best rate. Each auto insurer uses a different method to calculate rates, so rate quotes will be varied from one company to the next. Who Has Cheap Insurance Quotes for a Nissan Rogue in Michigan? Who Has the Cheapest Insurance for a Chevrolet Silverado in Michigan? How Much Does Insurance Cost for a Nissan Sentra in Michigan?